I use high quality materials for my work. In selecting canvas, paints, inks, protective coatings and other materials I look for archival quality, acid-free, and non-toxic environmentally safe products. The majority of my art pieces involve printing original digital images directly to canvas or fabric and then heat fusing to a pre-stretched gallery-wrapped canvas. 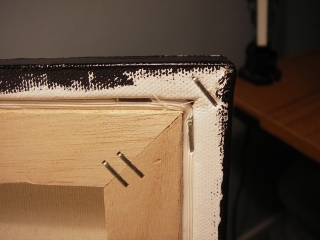 The sides of the canvas are usually painted black. All pieces are coated with a clear acrylic varnish for durability. 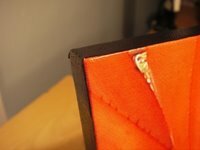 The resulting piece is suitable for display with or without a frame. Most pieces will be discreetly signed on the front in the lower right corner, but sometimes I will sign along the lower side or even on the back as not to interfere with the composition. I continue to experiment with new techniques and materials related to image transfer and embellishment as I explore colors, shapes, and textures within my compositions. I will generally produce several resulting art pieces based on a specific image, but I consider each piece to be a unique work of art. When posting an item for sale, I will represent only the exact piece for sale. If you are interested in a new version of any particular piece, I can generally accommodate requests. Contact me using my web form to discuss any details.